Welcome to S. K. Plastic, Manufacturer and Supplier of Plastic Bottles and Caps. The company was incorporated in 2002 at Kolkata. State-of-the-art infrastructure and Good financial position make us different from others. Sarada Homoeo Laboratory and Sakti Balm are some of our elite clients and we are backed by Client centric organization and Market leading prices. We offer a vast range of HDPE Plastic, Plastic Bottle Stoppers and Plastic. 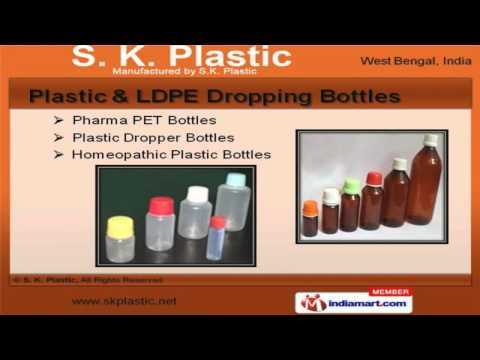 Our Plastic and LDPE Dropping Bottles are best in the industry amongst others. We offer Plastic and Seal Liner Caps that are widely appreciated in the market. HDPE Plastic and Plastic Cream Containers offered by us are cost effective. Along with that we offer Plastic Bottle Stoppers and Plastic Bottle Stoppers for Packaging Industry that are a class apart. Our HDPE Plastic Bottles for Cosmetic and PET Bottles for Pharmaceutical Packaging Industry are extremely reliable.